Hijauan Saujana a service apartment located at Saujana Resort. It is accessible using the New Klang Valley Expressway (NKVE), Lebuhraya Damansara Puchong (LDP) & Federal Highway. It is within a five kilometer radius from world class shopping centers, numerous restaurants, entertainment centers, medical centers, schools, and leading international hotels. Sited on a 5.5 acre of freehold land, the serviced apartments are housed in two blocks of 10 and 12 levels. With four types to choose from, the units come with built-ups ranging between 1,700 and 4,200 sq.ft. Those on the podium level, with built-ups of 1,700 sq ft, enjoy direct access to the garden. 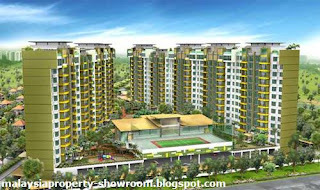 Each unit will also enjoy exclusivity, with a private access lift from the lobby to their doorstep. Facilities include Swimming and wading pools, jogging track, clubhouse, gymnasium, tennis court, barbeque pits, sauna, children's playground, games room, reading room, cafe, multipurpose room, laundry room. Built-up Area : 1,700 sq.ft. - 4,200 sq.ft.